Located in the historic 1912 Northern Pacific Railway depot the museum offers interesting displays depicting the early settlements and pioneer life in Lewis County, the oldest county in Washington State. Explore exhibits reflecting the area’s logging and rail history as well as a children’s hands-on area. The Museum is also the starting point for the Historic Chehalis Downtown Walking Tour. You can pick up a free copy here at the Museum or online at Historical Walking Tour Guide. This Mission Revival style building was built in 1912 as the principal passenger and freight station for the Northern Pacific Railroad. The site on which the depot is located achieved historical significance long ago. In anticipation of a reception for President McKinley, a giant stump, cut from a tree logged near Pe Ell, Washington, was placed at the site, and was to serve as a speaker’s platform for the President who ultimately did not make the visit. However, on May 23, 1903, President Theodore Roosevelt delivered a speech from this now famous podium. In 1908, presidential nominee, Eugene Debs, a Socialist, spoke from the stump. Later, although not yet President, William Howard Taft also spoke from the stump, as did vice presidential nominee, Franklin D. Roosevelt in 1920, who would later become president. The Northern Pacific Railroad (NP) reached the Chehalis River in 1872 from Kalama on the Columbia and the line reached Tacoma the following year. Regular service between the river and Tacoma began in January 1874. Just four months later, as many as 30 people per day were getting off at stations between the Columbia and the Sound. Residents of Saundersville built a warehouse to induce the Northern Pacific Railroad to build its line through Chehalis. 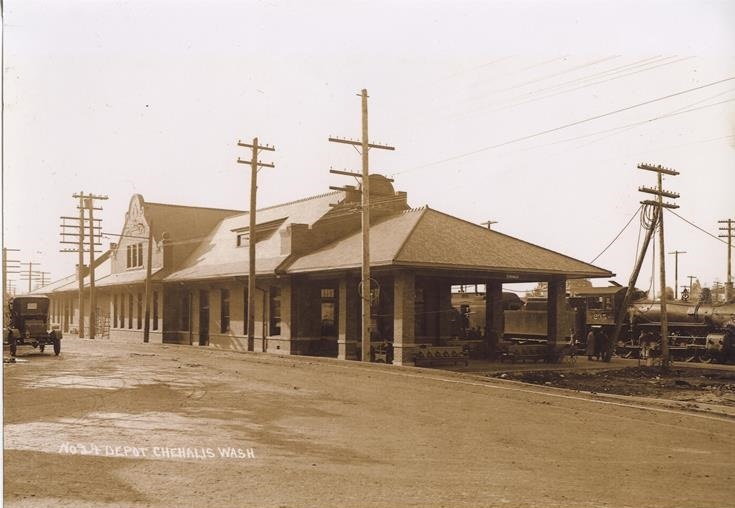 The idea worked and Saundersville was renamed Chehalis in 1879. Today, the Lewis County Historical Museum is housed in the historic, 1912 turn of the century, Northern Pacific Railway Depot. The Historical Society from held their first charter meeting on January 25th, 1965. Originally located in the Arthur S. Cory house after it was donated to the Society, a museum was operated until news arrived that Burlington Northern was going to tear down the Chehalis Depot in 1972. Society board members mobilized to save the depot. Arvo Kaija acted as liaison between the Historical Society’s Board and BN Railroad to secure the site. Minnie Lingreen performed research, consulted the state Attorney General’s office, and met with the Lewis County Commissioners to state the depot’s historical significance, while James Backman worked to add the 1912 building to both the state and national historic site lists. Finally, in 1975, the railroad and county agreed on a lease only for use as a museum. Work began in 1978 to renovate the historic depot so it could be used as a Museum and on September 18, 1979, a five day Grand Opening invited the public to the official home of the Lewis County Historical Museum. The Cory house was then sold and the money was used to establish the Society Endowment Fund to provide future funds from the interest generated that is used to preserve the history and legacy of Lewis County.